Renewable Energy and Biomass Treatment | DynaJets | Dynaflow, Inc. The rates of certain chemical reactions are enhanced by the DynaJets® cavitation. The advantage of hydrodynamic cavitation is that cavitation can be generated using less energy and is easier applied to larger volumes. The DynaJets® nozzles extend this advantage by creating hydrodynamic cavitation at very low pump pressures. This improves energy efficiency critical for scaling up for mass production. Recent advances in renewable energy using the DynaJets® in the area of biofuels includes increasing accessibility of woody lignocellulose to enzymes, recovery of triglycerides and other biomaterials from algae, and transesterification of vegetable oils for the production of biodiesel. Biodiesel is produced by converting triglycerides from vegetable oils and fats into fatty acid methyl esters (FAME), which can be combusted like petroleum diesel. When triglycerides react with an alcohol in the presence of a catalyst (base, acid or enzyme), the three fatty acids are separated from the glycerol backbone and combine with the alcohol to produce fatty acid alkyl esters. This reaction is mass transfer limited and the conversion efficiency depends on the interface area between the immiscible oil and alcohol. Thus emulsification of the solution will increase the reaction rate and the reaction yield. The DynaJets® succeed in emulsifying the alcohol-triglyceride-catalyst mixture and reduce reaction times and temperature requirements. More efficient mixing and faster reaction rates than conventional mixing are also obtained with the DynaJets®. Woody plant material, or lignocellulose, is one of the most abundant biomasses available for production of ethanol. Lignocellulose is a complex structure made of cellulose, hemicellulose, lignin, and extractives. The cellulose and hemiscellulose can be deploymerized and fermented to alcohol but first must be separated from the lignin. This delignification can be expensive and has limited the use of lignocellulose as an ethanol feedstock. DynaJets® are able to disrupt the structure of lignocellulose and increase the efficiency of enzymatic hydrolysis reactions. They reduce, for example, the particle sizes of corn cobs and pine saw dust without employing any high temperatures or chemical additions. Scanning Electron Microscopic (SEM) analysis was done on the untreated and treated samples of both the corn cob and the pine saw dust. The untreated sample for a corn cob shows an orderly honeycomb like structure. Subjecting it to the DynaJets® hydrodynamic cavitation breaks up the microstructure of the sample and shreds and frays the ends of the tube like structures. Similar observations were also made for pine saw dust using SEM. The orderly structure of the wood in the untreated sample were observed to be disrupted and the interior of the structures were exposed. Thus, the enzymes can penetrate more deeply into the lignocellulose structures and the yield of monosaccharides is increased. SEM image at 1000 X of pine dust prior to cavitation (left) and after cavitation (right). Photosynthetic algae use sunlight to convert CO2 into natural oils that are suitable for conversion into biodiesel. However, harvesting the algae and extracting the oil are currently difficult and expensive operations. Cheaper and more energy efficient processes are required before mass production of algae can be used to produce biodiesel economically. The DynaJets® cavitating jets allow collection of lipids and other intracellular material from algae growth media without pre-concentrating the algae. Solutions of algae can be lysed and the released cellular contents including lipids can be recovered. The cavitation, high shear, and rapid pressure changes cause the algal membranes to rupture and lyse. The triglycerides and other cellular material are then removed from the liquid and concentrated by entraining small air bubbles into the mixture. The hydrophobic compounds partition to the bubble water interface. A stable foam is formed when the bubbles rise to the free surface. The foam is then collected and the lipids recovered. Extracting and collecting the lipids from the dilute algae solutions avoids costly harvesting and drying processes and reduces the energy required to produce biofuel from algae. The DynaJets® cavitating jets technology is being further developed for renewable and green energy applications. Dynaflow, is interested in discussing possible applications and collaboration to commercialize this process. 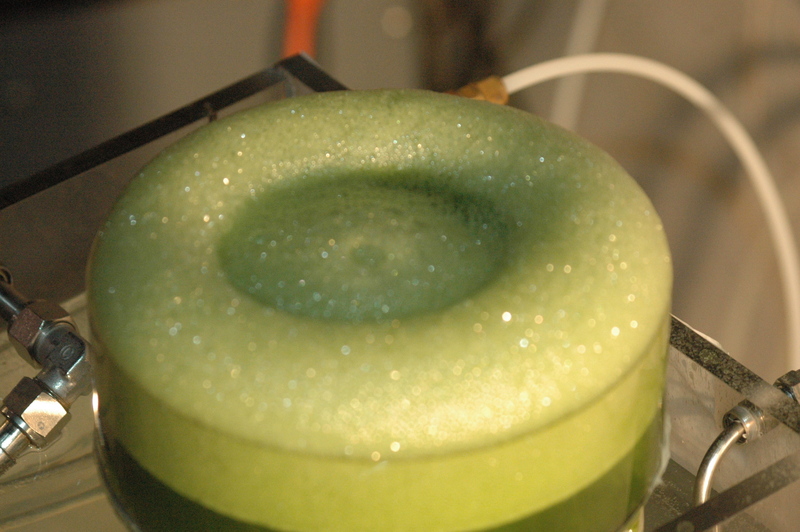 Lipids from Algae (Nannochloropsis) in foam recovered from extraction-collection process using the DynaJets®.